Rubber bands, plastic food wrap, bandages that conform to knuckles and knees, where would we be without them? These are all fairly recent inventions, but their elastic properties were imagined far before they actually came into existence. Around the turn of the 19th Century a mathematics genius by the name of Siméon Denis Poisson dabbled in higher level mathematics. He enjoyed working with calculus and probability theories and their applications, and his work eventually led to the discovery of his own special ratio, the “Poisson ratio.” Denoted today by the Greek letter “µ,” his discovery has a great deal to do with elasticity. In fact, much of his work evolved to become the modern study of engineering. If you’ll remember from last week’s blog, we talked about the elasticity of materials, including materials you generally wouldn’t think of as being elastic. In our steel rod example we saw that when you pull on the ends of a steel rod hard enough, you can actually stretch it and make it longer. But where does this extra length come from? According to Poisson’s ratio, as the rod lengthens, its diameter decreases proportionately. 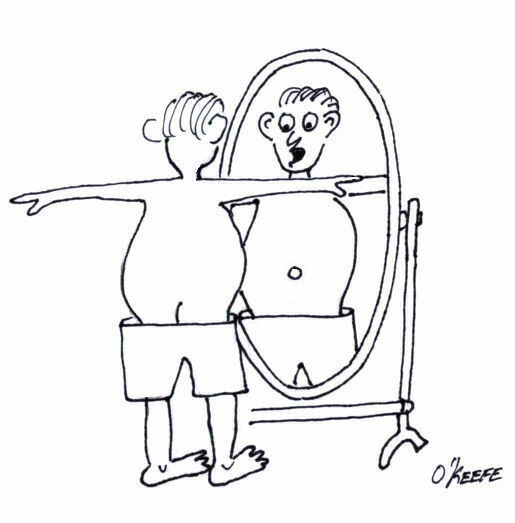 The rod’s increased length comes at the expense of its diameter. You can see this effect at work by repeatedly stretching that fat rubber band whose task it is to contain your bulging Sunday paper. The more you pull on it, the skinnier the rubber band becomes. It will eventually get to the point were its elastic properties have been so compromised it won’t even be able to hold together Monday’s paper. Over the decades that have passed since Poisson’s discovery a multitude of laboratory tests have been conducted to determine µ for a vast number of materials. These values have been duly tabulated in engineering reference books, doing away with the tedious task of conducting individualized experimentation by present day design engineers. Steel, for example, has a Poisson’s ratio of around 0.28, and this number is readily available in most strength of materials reference books. It’s pretty obvious why Poisson’s contribution is important to the world of engineering, but now let’s see how his ratio can be applied. This is approximately the thickness of nine sheets of paper. The change of .032 in the rod’s diameter may not seem like much, but in the world of machine parts it could mean the difference between parts fitting properly or becoming loose. This wraps up our short series on strengths of elastic materials. Next time we’ll move on to discuss coal power plant fundamentals, an arena in which many of the things we’ve been discussing take on real world meaning. When you think of elastic, you most likely think about the stuff that allows you to put your underwear on and helps it stay riding around your mid section. In the absence of a belt, a band of elastic is indispensable. What you probably don’t realize is that most materials, including those you consider to be just plain hard, like wood, plastic, and metal, are also elastic to some extent. They’re certainly not as elastic as the rubber that your underwear’s waist band is made of, but they do stretch, or deform, when you pull on them, depending on the force exerted. 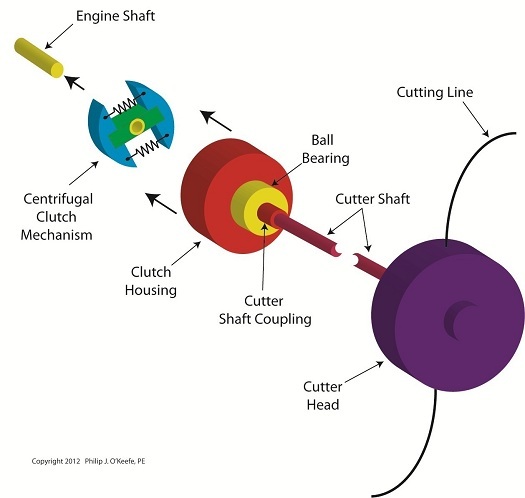 When engineers design a machine and specify that it is to be made out of particular materials, they have to take into account how much the materials will deform during usage. If metal parts in the machine become overly deformed due to operating forces, they may start interfering with each other. When that happens the machine will suffer with premature wear or perhaps even grind to a halt or fly apart. So how do we get a handle on this deformation factor? The first factor to consider is the stiffness of the material. In other words, when you try to pull it apart, a material will better resist the pull if it has high stiffness. In the world of engineering, this material stiffness is known as “modulus of elasticity” and is denoted by the letter E.
Over countless decades, testing laboratories have been helping design engineers by determining the values of E for all sorts of materials that are commonly used to fabricate machines and structures. For example, for most steels E has been determined to be about 30,000,000 pounds per square inch (Lb/in2). So let’s see how we can put E to work for us. Suppose you have to design a very heavy machine with a lot of precision parts. In that machine you have a round steel rod that has a steady 60,000 pound force pulling on it lengthwise. The rod is 2 inches in diameter and 15 feet (or 180 inches) long. How much will the rod stretch under the force? This stretch, or deformation, resulted in the rod’s length increasing by about the thickness of two dimes. You may think this is insignificant when speaking about a rod of 15 feet, but this deviation in size could lead to trouble if another machine part is in the way when the rod stretches. Unintended collision between machine parts is undesirable, no matter how you look at it. Next time we’ll investigate what happens to the diameter of our example rod when it stretches under the 60,000 pound load. When we looked at our statics example a few posts ago, it was convenient to consider the bridge beam as being perfectly rigid. In the real world, a bridge beam is not perfectly rigid. When it’s subjected to external forces, like the weight of a truck sitting in the middle of it, there is a tendency for it to bend, deform, change its shape. If the external forces create bending and deformations that are too much for the bridge beam material to handle, it will collapse. In strengths of materials analysis, engineers must consider typical stresses that will occur within objects like bridge beams, airplane wings, bolts, and machine parts during use. Stress is a measure of force exerted per unit area of a surface. 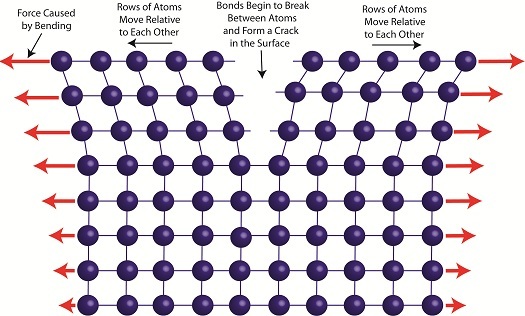 Once the stresses are known, a material is selected that is strong enough to keep the object from being bent, mashed, stretched, and/or broken. To illustrate this, let’s consider an example of a simple stress. Suppose you want to design a truss rod for a highway bridge like the one shown in Figure 1. 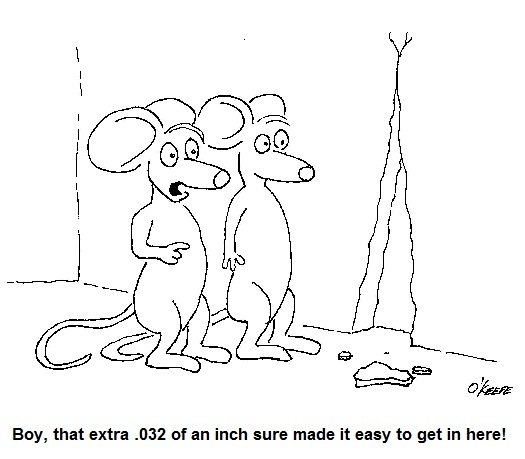 Specifications require that the rod be two inches in diameter. Its purpose is to hold the sides of the bridge together when vehicles travel across it. Now suppose that the bridge is to handle traffic to and from and iron mine. Let’s consider the scenario where a truck laden with iron ore runs out of gas and comes to a stop in the middle of our bridge. Under this load, static analysis reveals that the sides of the bridge want to spread apart, putting a tension of 50,000 pounds force (Lbf.) on the truss rod as shown in Figure 2. 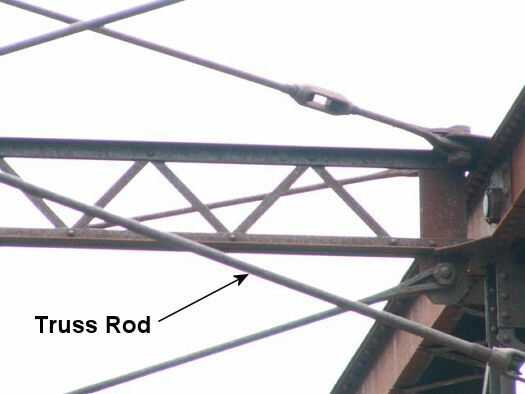 Since the external force acting upon the truss rod and the diameter of the rod itself are both given, the engineer would merely have to select the appropriate material for the rod that would fall within the desired parameters, that is, so as to keep our rod from pulling apart when anticipated stressors such as a heavy truck is on the bridge. Knowing the stress within the rod, the engineer would next have to select an appropriate material for the rod that’s strong enough to do the job. In our case, let’s say we determine that steel is the best material to use. But what type of steel? Well, there are engineering handbooks with tables that list the mechanical properties of all sorts of materials, including metals and plastics, and along with those properties there is listed their ability to handle stress. These mechanical properties were determined in laboratory tests where carefully machined specimens of the materials were subjected to measured stresses until they deformed and broke apart. They include yield strength and ultimate strength, and these findings have been duly recorded so that future engineers need not go through independent testing of common materials themselves. Yield strength is the stress that is measured when the test specimen begins to stretch without any significant increase in force being applied to it. Ultimate strength is the maximum stress that the material in the test specimen can withstand before it starts to fail, that is tear apart, break, collapse. Our engineer would use the mechanical properties tables that are readily available to him to select the appropriate steel alloy that would meet our criteria, that is, has a listed strength high enough above the calculated 15,915.49 Lbf./in.2 tensile stress to provide a sufficient factor of safety. Factors of safety are listed in engineering books for yield strength and ultimate strength and they are selected depending on how the forces are applied to a structural component or machine part (e.g. steady, varying, or shock). When strengths of materials analysis involves the solution of complex statics and dynamics problems, things become a little less straightforward. And when you are dealing with components having odd shapes and a combination of stresses, say due to compression and torsion, things become even more complex. In any case, engineers must have extensive knowledge of the properties of materials in order to anticipate factors at play in real world scenarios such as the one we’ve been discussing. Ever wonder why some steel is hard and brittle, and some is soft and bendable? 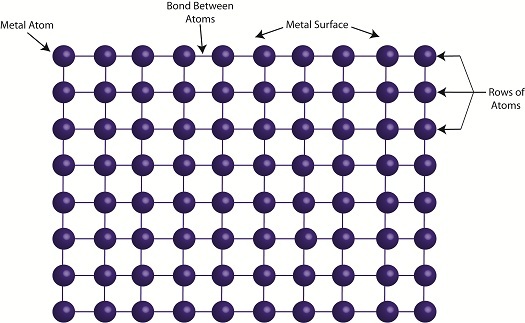 Well, our next topic of discussion will be about materials science, the study of how metal alloys and polymers are formed to have specific properties.